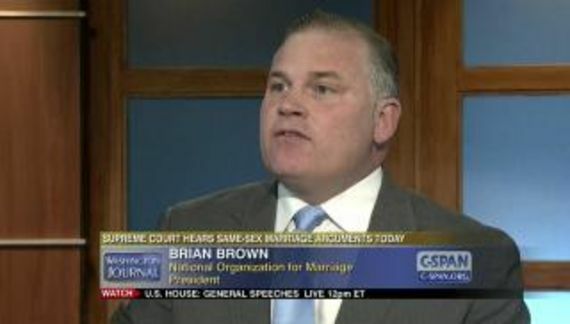 National Organization for Marriage has announced a new campaign “To Defeat Missouri Representative Anne Zerr Who Betrayed Missourians, Denying Them The Right To Vote On Critical Religious Liberty Protections.” When did NOM or Brian Brown move to Missouri? Following through on a promise made to citizens last April when the Missouri House of Representatives refused to pass SJR 39, the National Organization for Marriage (NOM) today announced they have launched, through their NOM in Missouri PAC, a campaign to defeat Rep. Anne Zerr in the 23rd Senate District Republican primary. NOM in Missouri is funding mailings and phone calls urging voters to defeat Zerr in the August 2nd primary and elect her principal opponent, Bill Eigel. The Club for Growth has donated $175,000 to Eigel. Zerr currently has about a six point lead which is within the margin of error. Both candidates are anti-Choice, pro-gun Republicans. Eigel doesn't have any of the “religious liberty” (code for LGBT discrimination) nonsense on his campaign's site. Eigel states a strong opposition to Common Core which means that he either doesn't know what Common Core is or he is pandering. I doubt that NOM can have much impact on this campaign but if Eigel wins they will take all of the credit. Anne Zerr has subjected supporters of marriage, Christians and people of faith to punishment and persecution for standing true to their beliefs. She has sided with LGBT extremists who want to punish people of faith for supporting marriage and use the full power of government to persecute them. Zerr has subjected churches, pastors, religious charities and schools, individuals and small businesses to lawsuits, fines, the loss of their livelihoods and the ruin of their reputations. We urge voters to defeat her. What fun. Victims galore who have been punished and persecuted. Oh my. NOM originally promised to unseat three GOPers. As I noted then, SJR 39 was a particularly nasty piece of legislation that would have put a license-to-discriminate on the ballot in November. Missouri would have been flooded with outside money from the usual sources and LGBT citizens (including children) would have had to endure campaign ads portraying them as sociopathic, child recruiting perverts. Subsequent to my post in April, NOM formed a committee in Missouri. No, I am not claiming responsibility for NOM's compliance. The treasurer is James Thomas, III who is an attorney, lobbyist and Republican operative. The quarterly report for July 15 is all zeroes. On July 11, the committee received $6,300 from NOM. I do not know why but NOM is using a Manassas, VA address in the filing.